Here’s a wonderful piece that takes us all back. This is a Gibson SG SR VOS 1961, a reissue of the reworked 1961 Les Paul Standard with Lyre Vibrola and Cherry finish. 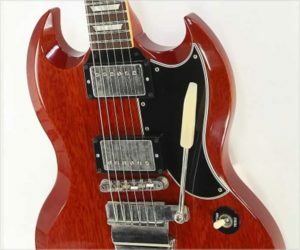 This was the second version of the SG build – the initial production run had a side-to-side vibrola tailpiece. That was quickly replaced with the Maestro Lyre Vibrola, and this form was the SG Standard until the mid 1960’s. By 1963, the Les Paul name was removed for contractual reasons.